The fish are still taking Hoppers and other dry patterns with wild abandon. The water is perfect and the weather is too good for words. 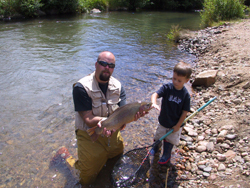 What could be better…..having your son and grandson out for the day hooking up with fish like the above. If you get to visit us chances are very good that you will be in a photo like this one with the biggest trout you ever landed. There are a few days left to book in October. See you soon.